From Goodreads: When Liv Bloom lands an art scholarship at Wickham Hall, it’s her ticket out of the foster system. Liv isn’t sure what to make of the school’s weird traditions and rituals, but she couldn’t be happier—especially when Malcolm Astor, fellow artist and scion of one of the school’s original families, starts falling for her. Fellow scholarship kid Gabe Nichols warns her not to get involved with a “Wicky,” but things are finally going Liv’s way, and all she wants to do is enjoy it. But Liv’s bliss is cut short when she is viciously murdered. In death, she discovers that she’s the latest victim of a dark conspiracy that spans 150 years and many, many lives. Gabe, cursed with the ability to see their ghosts, turns out to be Liv’s only link to the world of the living. Liv must rely on Gabe’s help to prove to Malcolm that she’s still present… lingering with the other spirits. Together, Liv, Gabe, and Malcolm fight to expose the terrible truth that haunts the halls of Wickham before more lives are lost. This a very well written story that, unfortunately, starts out just like all the other boarding school novels I’ve read lately. A scholarship student goes to a boarding school, isn’t liked by many, falls in love with the school hottie, and… is killed… finds out there is some bad mojo with the secret society within the school… realizes there are ghosts around… and basically fits the mold for the “boarding school” YA novel. It reminds me a little of a mash up of Poor Little Dead Girls, And We Stay, and Deceived. Now don’t get me wrong, those are all good books, but I really wanted something different with this one, and even though these books are all different, there’s enough similarities that it just didn’t pique my interest all that much in the beginning. 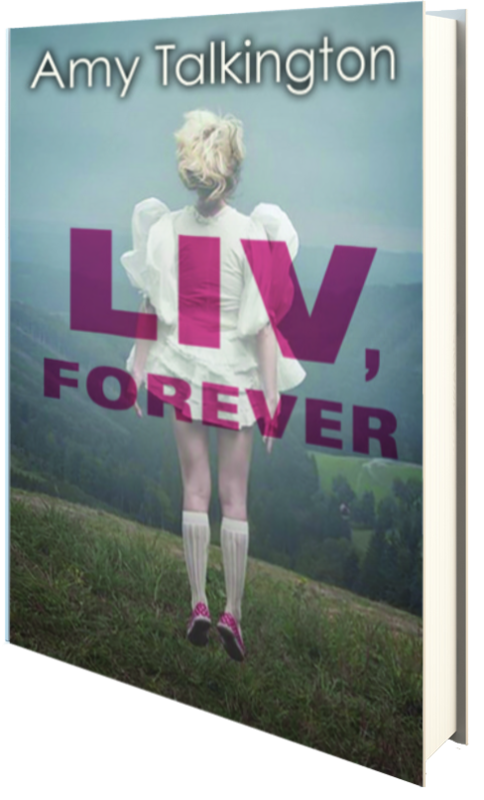 Now, Liv, Forever focuses on Liv’s death, whereas the other novels I’ve read focus more so on attempted murders, so that was a nice change, especially as Liv’s ghost comes back to haunt Gabe as they try to figure out what happened. And, while the first half of the novel fits the mold for this type of novel nicely, the last half of the book is where is begins to branch out and become a different story, which in turn caught my interest. If you’ve never read a novel that takes place in a boarding school before, then I’d definitely recommend this as a good starting point. I enjoyed the aspects of the ghosts, and I liked Liv, Gabe, and Malcolm as characters. I also especially enjoyed the stories of each ghost’s death, told in first person, as if readers are drawn into the story to put the pieces together. However, I felt the beginning dragged on a bit and it just seemed too much like déjà vu for me as a reader, especially with the similarities to novels that have come before it, so even though I enjoyed some aspects, it doesn’t stand out in my mind, personally, all that much. Three stars. Soho Teen has been extremely gracious in allowing me to read an ARC of this novel, via Edelweiss, prior to its release on March 11, 2014, in exchange for an honest review.